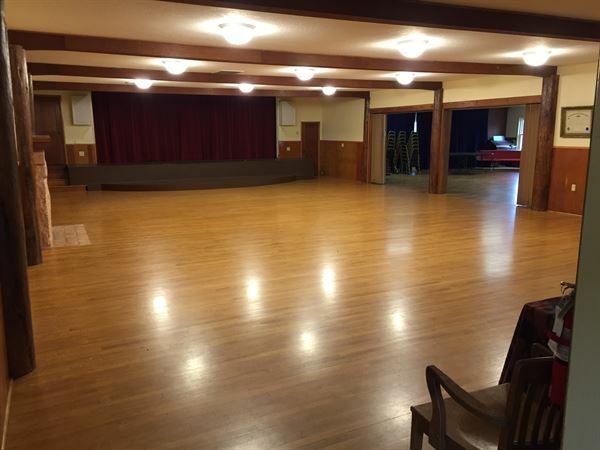 A lovely 1926 built hall with beautiful hardwood floors, two sides each totaling about 2400 square feet of useable space, divided by accordion curtains, walls and doors. The main side has a raised stage with a plush burgundy velvet stage curtain, and burgundy black out curtains at the four windows, a gas fireplace, and an AV station for audio/visual and stage lighting needs. Screen, projector, stage lighting makes it versatile and creative. Separate bathrooms are adjacent. The other side is a meeting/dining room with a fully equipped kitchen at one end with two ovens, two refrigerators and dish and glass service for approximately 135 people. Capacity of the hall space is 250-300 people. 8' tables and chairs, folding and other are available.